DETROIT -- Ford Commercial Solutions, a branch of the automaker's mobility unit, is expanding digital services to help fleet operators better monitor and maintain vehicles. One is a product that wirelessly beams information on a vehicle's GPS location, mileage, fuel usage, operating conditions, and driver behavior and more to the cloud without the need for third-party plug-in devices. The second service is similar but is specific to law enforcement agencies and lets them collect data about a vehicle's fuel consumption, carbon dioxide emissions, health and driver seat-belt usage and allows access through a unique website application. Ford Motor Co. is working to connect all of its vehicles by 2019. It had previously announced a service agreement with Verizon Connect to serve as a telematics service and on Thursday said it has reached similar partnerships with Geotab and Spireon to give fleet operators more choices. "Our new products are tailored to serve fleets of all types, whether they're run by law enforcement, composed predominantly of Ford vehicles, or are large multi-make fleets that want more insight from their Ford vehicles," Lee Jelenic, CEO of Ford Commercial Solutions, said in a statement Thursday. The products are among the first offered by Ford Smart Mobility since the automaker reorganized the unit this year. Executives have said mobility services could deliver higher profit margins than Ford's core automotive business, and Ford is working on how to monetize emerging technologies. 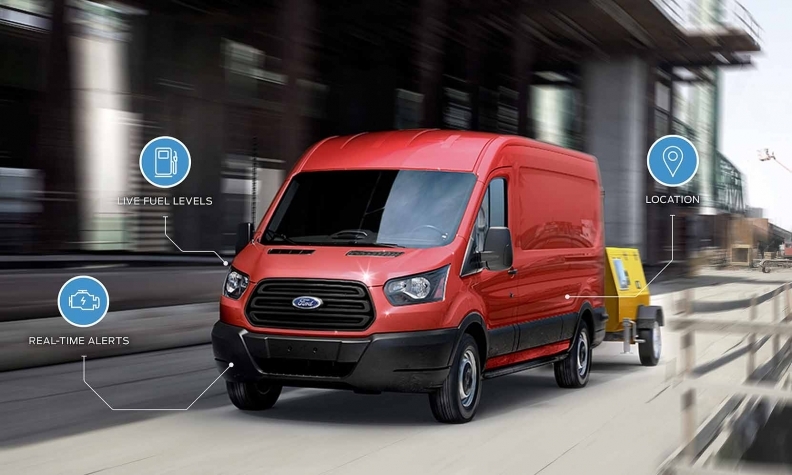 Commercial fleets are one of the automaker's largest targets because it dominates the U.S. market with the Transit and Transit Connect vans and the F-series pickup. The products introduced Thursday are powered by Ford's open cloud-based platform, the Transportation Mobility Cloud, which is built and operated by Autonomic, a Silicon Valley startup Ford acquired this year. The goal of the Transportation Mobility Cloud is to provide fully established, back-end technology so Ford and other automakers can focus on creating products customers want. Sundeep Madra, a co-founder of Autonomic and vice president of Ford X, which oversees Autonomic's work, said dealers and fleet operators are increasingly interested in how the cloud can help them. He said dealers could use the cloud to alert customers of maintenance issues and schedule appointments to a time when the repair shop would have loaner cars available. "They're really excited about that coming together," Madra said Thursday at the TU-Automotive technology conference in Novi, Mich. "The cloud enables all that to happen."